(CNN) -- A shooting at an LA Fitness gym outside Pittsburgh, Pennsylvania, killed at least four people and wounded several others, a local official told CNN. 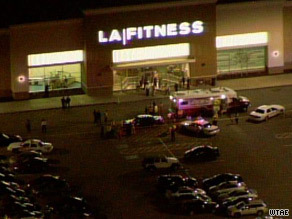 Authorities at the scene of a shooting at an LA Fitness gym near Pittsburgh, Pennsylvania. The shooter, whose identity was not immediately released, was among the fatalities, said Gary Vituccio, manager of Collier township. At least 10 shooting victims arrived at the three major hospitals in the area. A spokeswoman for Mercy Hospital confirmed five female shooting victims arrived at the facility with multiple gunshot wounds. Three were in serious condition, and two were listed as critical, she said. Allegheny General Hospital received two wounded patients at its trauma center, a spokesman said. Both of victims are women and were listed in fair condition, he said. A St. Clair Hospital spokesman said three shooting victims arrived there Tuesday night; two were in stable condition and one patient, who was shot in the chest, died at about 8:55 p.m. It wasn't clear whether the death at St. Clair was included in the fatalities confirmed by Vituccio. Perry Calabro of nearby Bridgeville told CNN he was between racquetball games at the gym when he heard screaming and multiple gunshots. He said he ran out and didn't see the gunman or others. Other witnesses told CNN affiliate WTAE that the lights went out before they saw flashes in dark -- what they later realized was gunfire. Witnesses told WTAE that a man unrecognized by the gym's staff shot people in a Latin dance class. A witness identified as Nicole told WTAE that about 30 women were in the class when "a middle-aged white male walked into the class. He had a big gym bag." "He looked out of place in a class full of women," according to the witness, who told WTAE the man put down the bag, turned off the lights and opened fire.